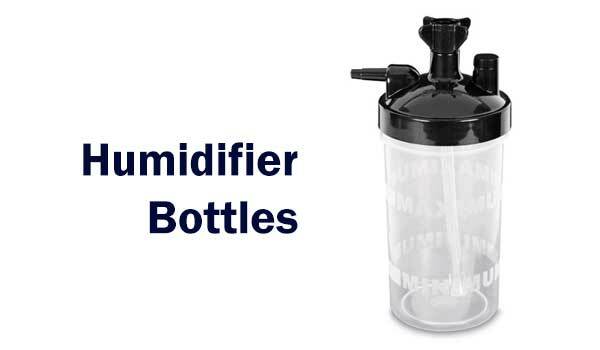 Humidifier bottle is a medical device used to humidify oxygen, increases humidity or moisture and decrease dryness of supplemental oxygen during therapy and emergencies with oxygen supplying system. .Commonly it is known as Oxygen humidifier bottle Humidifier provides long-lasting moisture for utmost patient comfort during therapy and medical procedures. Humidified oxygen provides comfort to patient and prevents drying nose, mouth, lungs and respiratory membranes. Oxygen passes through the water (Distilled or pure drinking water) in bottle from the oxygen administration equipment, such as cylinders (oxygen tanks) liquid oxygen cylinder, portable oxygen concentrator or home oxygen concentrator and piped-in oxygen system. Humidifier bottle filled with water up to mark is attached with the administration equipment for oxygen therapy and procedures, the bottle attaches to an adapter on the flow meter. The Cannula or mask connects to the opposite side of the humidifier.